Good medical care depends upon effective communication between doctors and patients. Currently, hospitals face greater than ever challenges in trying to meet the needs of persons with limited English proficiency (LEP) or who are deaf, hard of hearing, blind or visually impaired. 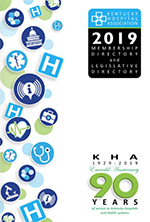 In 2006, KHA joined the American Hospital Association and the Office for Civil Rights, of the U.S. Health and Human Services Department, in their efforts to overcome those challenges and to address the growing needs of its member hospitals. The Effective Communication in Hospitals Initiative is a nationwide undertaking in which 14 hospital associations, including Kentucky's, are actively participating. The Initiative's website provides additional information about the project including a Question and Answer section. Increasingly, issues associated with language, literacy, culture and other aspects of diversity are being tied to quality and patient safety concerns. The links provided here contain tools and free information to support hospitals as they work to ensure effective communication and the highest quality care for patients who are LEP, deaf, hard of hearing, blind or visually impaired.